The average value of prime Scottish property fell for the fifth consecutive quarter between April and June. Prices have now been flat or falling for two years, slipping by 6% over that time. Yet the market is highly regionalised, with property values in the Scottish borders remaining unchanged in the second quarter, and up 2.4% year-on-year. Prime house prices in Argyll fell by a marginal 0.2% in the quarter, compared to a decline of 2.1% in Lothian and 1.2% in the North of Scotland. Ran Morgan, Head of Knight Frank’s Scottish residential department, says: “The lack of mortgage finance continues to impact the Scottish country house market, with many families choosing to stay in their current home rather than moving up the housing ladder. While there has been a rise in the number of prospective buyers registering interest, with a 15% increase in new buyer applicants in April and May compared to the same period last year, transactions over the same period were more muted, falling by 25%. 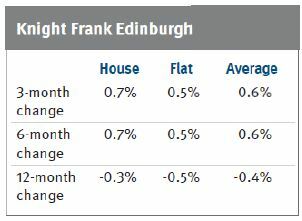 In contrast, activity in Edinburgh picked up markedly over the same period, with a 50% rise in exchanges, underpinning a 0.6% rise in prices in the second quarter. This is the first time prime prices have risen in the Scottish capital for more than a year, but average prices are still 0.4% lower than Q2 last year. Other indicators also signalled a busy market in the second quarter, with a 31% rise in applicant volumes in May alone, and a 89% rise in viewings during April and May compared to the same period last year. Matthew Munro, partner at Knight Frank’s Scottish residential department, says: “This year has been busier than any of the last four years since the market downturn in the wake of the financial crisis, especially in the market for flats and homes priced up to £1.2 million. Family homes in the well-recognised and desirable residential areas such as New Town, Morningside and Murrayfield are in short supply and therefore attract attention when they come on to the market. “The pickup in activity has been triggered by pent-up frustration in Edinburgh – supply has been limited and many prospective buyers have been forced into rental accommodation instead. The slight increase in stock has breathed some life into the market. “While the market for properties priced at between £1.2 million and £2 million has also picked up so far this year, there has been limited activity in the market for £2 million plus properties, primarily because of the new 7% stamp duty charge.